Larry J. Sabato's Crystal Ball » 2010 HOUSE RESULTS: A PORTENT OF INCREASED COMPETITION? 2010 HOUSE RESULTS: A PORTENT OF INCREASED COMPETITION? Over the last generation a cottage industry has built up decrying the lack of competition in congressional elections. Not only have the House reelection rates been high, but so have the margins of victory. In each election from 1998 through 2008, no more than 15% of House winners were elected with less than 55% of the total vote in their district. But there are signs that the era of such pro-incumbent results may be ebbing. In 2010, the level of competition in congressional elections spiked. 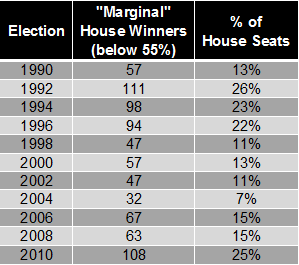 The number of sub-55% winners (often described as “marginals”) jumped to 25% of the entire House, the highest percentage in any election since 1992. And this quantitative measurement does not include such high-profile races as those involving Democratic Reps. Alan Grayson of Florida and Chet Edwards of Texas, where the incumbents lost in a landslide. Rather than an aberration, the 2010 results could very well portend the start of a new, more competitive era of House elections—one that could last at least as long as the economy remains sluggish, voters remain disgruntled, and Congress appears dysfunctional. For much of the last few decades, there were compelling reasons for a dearth of competition in House races. Incumbents often possessed an array of advantages that their opponents could not match—namely, a sizable campaign chest, the perquisites of office (which often included “earmarks” for projects back home), and favorable district lines to run in courtesy of political allies in their home states. But these incumbent advantages have been offset of late by other factors. Public esteem for members of Congress has withered as polarization and partisanship have come to define Capitol Hill. As a consequence, the electorate has become increasingly untethered, swinging dramatically back and forth since 2006 – first in favor of the Democrats, then the Republicans. As the force of the political winds have picked up, more and more congressional seats have become targets of opportunity for the party on the offensive. And as the playing field has expanded, new sources of money have been found to fund many challengers who in the past would not have made it to the starting line. A number of challengers have relied on relatively new technology, such as the internet, to raise the bulk of their money. Others have looked to the burgeoning number of lucrative independent expenditure groups to help make them financially competitive with well-heeled incumbents. The upshot: many House members who in the past could count on large war chests to scare away potential opposition have found in recent election cycles that money has not been as great a deterrent. There were more competitive House races in 2010 than in any election since 1992. That, as measured by the number of “marginal” winners—defined here as those candidates elected in their districts with less than 55% of the total vote. As recently as 2004, the proportion of sub-55% winners was less than 10% of the entire House. This year, it was 25%. 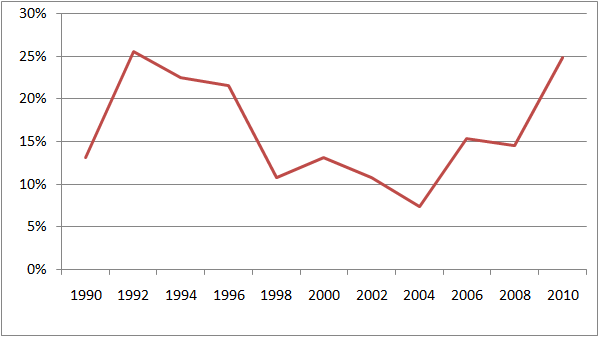 Sources: The December 2009 issue of “The Rhodes Cook Letter” for the number of sub-55% House winners in elections from 1990 through 2008. For 2010, the number is based on a compilation by the author of official House results obtained from state election web sites. Altogether, 108 House winners this year were elected with less than 55% of the vote. Sixty were Republicans, a number of whom were challengers who ousted Democratic incumbents. Forty-eight were Democrats, many of whom were sitting members who were barely able to withstand the GOP onslaught. The list of Democratic marginals, in particular, was an eclectic group. At one end of the spectrum was a pair of narrow winners in 2009-10 special elections, Bill Owens of upstate New York and Mark Critz of southwest Pennsylvania. At the other end were veteran liberal Democrats, such as Barney Frank of Massachusetts, Dennis Kucinich of Ohio, and Lloyd Doggett of Texas, all of whom fell below 55% this fall in districts that were previously considered to be safely Democratic. 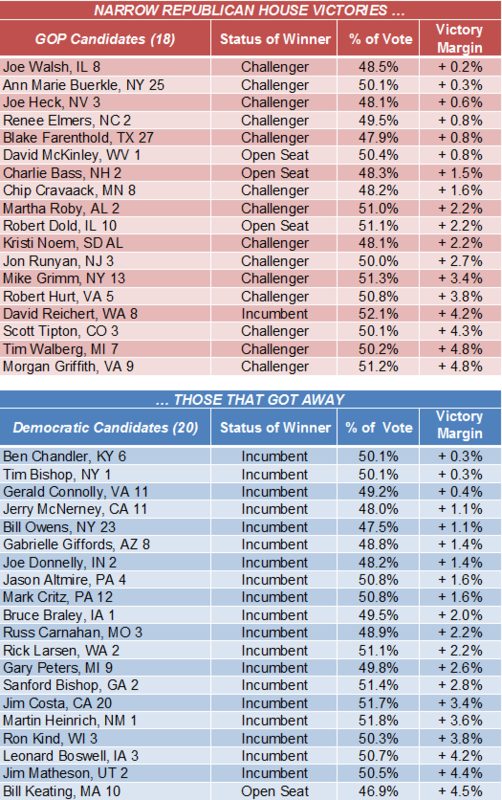 With Republicans on the offensive in 2010, their list of sub-55% winners was loaded with challengers and open-seat candidates. But the occasional incumbent could be spotted among the GOP marginals, including Joe “You Lie” Wilson of South Carolina, who for the second straight election retained his seat with less than 55% of the vote. This year’s large class of marginal House winners could be found in abundance in all regions of the country, from 23 in the increasingly solid Republican South to 31 in the volatile Midwest. But arguably the largest cluster of competitive House seats lay in a band from the eastern tip of Long Island to Cincinnati, Ohio. In the three states of New York, Ohio and Pennsylvania, nearly two dozen House victors were held to less than 55% of the vote. In New York alone, there were nine such winners, as Republicans trimmed what had been an almost laughable 27-2 deficit in the Empire State House delegation to 21-8. Whether there is an even greater number of competitive races in 2012 could depend on the upcoming round of redistricting. The decennial line drawing has often shaken up the political landscape, producing new and uncertain terrain for incumbents to deal with. As such, the process can contribute to a sharp increase in the number of closely contested races, which was the case in the early 1990s. Then, the number of sub-55% winners nearly doubled from the pre-redistricting election of 1990 to the post-redistricting election of 1992. But in the last round of redistricting a decade ago, the trend tended to be toward protecting incumbents of both parties, with the number of marginal House winners actually declining from 2000 to 2002. What will be the modus operandi in congressional redistricting this time—incumbent protection or partisan line drawing? The latter would certainly represent the tenor of the times, underscored by the Republicans’ ability in last month’s voting to sharply increase their influence in state legislatures around the country. Yet the betting is that regardless of redistricting, the volatile forces that shaped the political landscape in 2010 will not recede quickly. That may not be great for the country as a whole. But for those who want to see more competition in House elections, that is all to the good. Nearly one out of every 10 House winners this fall (38 out of 435) were elected by a margin of less than 5 percentage points. In partisan terms, this number was closely divided – 20 Democrats and 18 Republicans. But while the bulk of the narrow GOP winners were successful challengers who ousted Democratic representatives, virtually all of the Democrats who triumphed by less than 5 points were incumbents who barely survived the strong political headwinds. Source: Based on official returns for the 2010 general election from state election web sites.